​​Innovaccer Inc., a leading healthcare analytics company, has been selected as one of the Healthcare Tech Outlook’s 10 Most promising Population Health Management Solution Providers of 2017. The nationally distributed annual list by Healthcare Tech Outlook showcases the 10 most promising Population Health Management Solution providers. Innovaccer with its cutting-edge technology has helped organizations with real-time point of care decision support driving better clinical outcomes. Innovaccer is launching the advanced version of its proprietary product Datashop as the operating system that powers healthcare at HIMSS 2017 conference in Orlando. A truly interoperable platform, Datashop provides an end-to-end solution to all healthcare organizations that simplifies access, analysis, reporting, and tracking of outcomes. Innovaccer will launch the operating system that powers healthcare at Booth # 6179-13 in Population Care Management Center at HIMSS 2017 in Orlando. Innovaccer Inc is a Silicon Valley-headquartered, Healthcare analytics company. 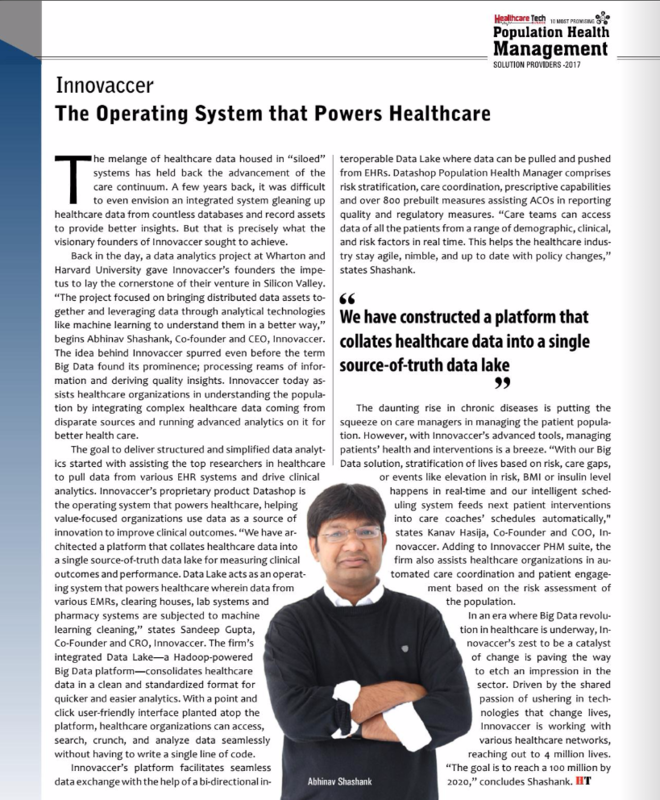 Innovaccer’s aim is to simplify complex data from all points of care, streamline the information and help organizations make powerful decisions based on the key insights and predictions from their data. Its proprietary product Datashop enables provider organizations to use data as a source of innovation and has been deployed across 15 countries at academic institutions, governmental organizations, and several corporate enterprises such as Catholic Health Initiatives, Rochester RHIO, El Paso HIE, Sonic Healthsystems, Catalyst, Stratifi, Harvard, Stanford, MIT, and Wolters Kluwers.